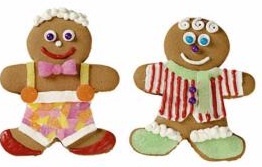 Gingerbread Girl, Boy, Man, Stories, Fun & More! Remember the story of the Gingerbread Man? Once upon a time there was a little old woman and a little old man, and they lived all alone in a little old house. They had ‘t any little girls or any little boys, at all. So one day, the little old woman made a boy out of gingerbread; she made him a chocolate jacket, and put cinnamon seeds in it for buttons; his eyes were made of fine, fat currants; his mouth was made of rose-colored sugar; and he had a gay little cap of orange sugar-candy. When the little old woman had rolled him out, and dressed him up, and pinched his gingerbread shoes into shape, she put him in a pan; then she put the pan in the oven and shut the door; and she thought, “Now I shall have a little boy of my own.” Visit here for more! A jolly Gingerbread girl and boy all dressed up in their colorful and surely sweet outfits ready to be part of your holidays! Visit here for the recipe and pattern .